For other people named Ken Thompson, see Ken Thompson (disambiguation). Kenneth Lane Thompson (born February 4, 1943) is an American pioneer of computer science. Having worked at Bell Labs for most of his career, Thompson designed and implemented the original Unix operating system. He also invented the B programming language, the direct predecessor to the C programming language, and was one of the creators and early developers of the Plan 9 operating system. Since 2006, Thompson has worked at Google, where he co-invented the Go programming language. Thompson was born in New Orleans. When asked how he learned to program, Thompson stated, "I was always fascinated with logic and even in grade school I'd work on arithmetic problems in binary, stuff like that. Just because I was fascinated." Thompson received a Bachelor of Science in 1965 and a Master's degree in 1966, both in Electrical Engineering and Computer Science, from the University of California, Berkeley, where his master's thesis advisor was Elwyn Berlekamp. Thompson was hired by Bell Labs in 1966. In the 1960s at Bell Labs, Thompson and Dennis Ritchie worked on the Multics operating system. While writing Multics, Thompson created the Bon programming language. He also created a video game called Space Travel. Later, Bell Labs withdrew from the MULTICS project. In order to go on playing the game, Thompson found an old PDP-7 machine and rewrote Space Travel on it. 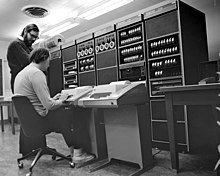 Eventually, the tools developed by Thompson became the Unix operating system: Working on a PDP-7, a team of Bell Labs researchers led by Thompson and Ritchie, and including Rudd Canaday, developed a hierarchical file system, the concepts of computer processes and device files, a command-line interpreter, and some small utility programs. In 1970, Brian Kernighan suggested the name "Unix", in a somewhat treacherous pun on the name "Multics". After initial work on Unix, Thompson decided that Unix needed a system programming language and created B, a precursor to Ritchie's C.
In the 1960s, Thompson also began work on regular expressions. Thompson had developed the CTSS version of the editor QED, which included regular expressions for searching text. QED and Thompson's later editor ed (the standard text editor on Unix) contributed greatly to the eventual popularity of regular expressions, and regular expressions became pervasive in Unix text processing programs. Almost all programs that work with regular expressions today use some variant of Thompson's notation. He also invented Thompson's construction algorithm used for converting regular expression into nondeterministic finite automaton in order to make expression matching faster. I did the first of two or three versions of UNIX all alone. And Dennis became an evangelist. Then there was a rewrite in a higher-level language that would come to be called C. He worked mostly on the language and on the I/O system, and I worked on all the rest of the operating system. 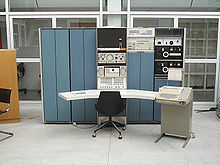 That was for the PDP-11, which was serendipitous, because that was the computer that took over the academic community. Feedback from Thompson's Unix development was also instrumental in the development of the C programming language. Thompson would later say that the C language "grew up with one of the rewritings of the system and, as such, it became perfect for writing systems". In 1975, Thompson took a sabbatical from Bell Labs and went to his alma mater, UC Berkeley. There, he helped to install Version 6 Unix on a PDP-11/70. Unix at Berkeley would later become maintained as its own system, known as the Berkeley Software Distribution (BSD). Along with Joseph Condon, Thompson created the hardware and software for Belle, a world champion chess computer. He also wrote programs for generating the complete enumeration of chess endings, known as endgame tablebases, for all 4, 5, and 6-piece endings, allowing chess-playing computer programs to make "perfect" moves once a position stored in them is reached. Later, with the help of chess endgame expert John Roycroft, Thompson distributed his first results on CD-ROM. Throughout the 1980s, Thompson and Ritchie continued revising Research Unix, which adopted a BSD codebase for the 8th, 9th, and 10th editions. In the mid-1980s, work began at Bell Labs on a new operating system as a replacement for Unix. Thompson was instrumental in the design and implementation of the Plan 9 from Bell Labs, a new operating system utilizing principles of Unix, but applying them more broadly to all major system facilities. Some programs that were part of later versions of Research Unix, such as mk and rc, were also incorporated into Plan 9. Thompson tested early versions of the C++ programming language for Bjarne Stroustrup by writing programs in it, but later refused to work in C++ due to frequent incompatibilities between versions. In a 2009 interview, Thompson expressed a negative view of C++, stating, "It does a lot of things half well and it's just a garbage heap of ideas that are mutually exclusive." In 1992, Thompson developed the UTF-8 encoding scheme together with Rob Pike. UTF-8 encoding has since become the dominant character encoding for the World Wide Web, accounting for more than half of all web pages. In the 1990s, work began on the Inferno operating system, another research operating system that was based around a portable virtual machine. Thompson and Ritchie continued their collaboration with Inferno, along with other researchers at Bell Labs. When the three of us [Thompson, Rob Pike, and Robert Griesemer] got started, it was pure research. The three of us got together and decided that we hated C++. [laughter] ... [Returning to Go,] we started off with the idea that all three of us had to be talked into every feature in the language, so there was no extraneous garbage put into the language for any reason. According to a 2009 interview, Thompson now uses a Linux-based operating system. In 1980, Thompson was elected to the National Academy of Engineering for "designing UNIX, an operating system whose efficiency, breadth, power, and style have guided a generation's exploitation of minicomputers". In 1983, Thompson and Ritchie jointly received the Turing Award "for their development of generic operating systems theory and specifically for the implementation of the UNIX operating system". His acceptance speech, "Reflections on Trusting Trust", presented the backdoor attack now known as the Thompson hack or trusting trust attack, and is widely considered a seminal computer security work in its own right. In 1990, both Thompson and Dennis Ritchie received the IEEE Richard W. Hamming Medal from the Institute of Electrical and Electronics Engineers (IEEE), "for the origination of the UNIX operating system and the C programming language". In 1997, both Thompson and Ritchie were inducted as Fellows of the Computer History Museum for "the co-creation of the UNIX operating system, and for development of the C programming language". On April 27, 1999, Thompson and Ritchie jointly received the 1998 National Medal of Technology from President Bill Clinton for co-inventing the UNIX operating system and the C programming language which together have led to enormous advances in computer hardware, software, and networking systems and stimulated growth of an entire industry, thereby enhancing American leadership in the Information Age . In 1999, the Institute of Electrical and Electronics Engineers chose Thompson to receive the first Tsutomu Kanai Award "for his role in creating the UNIX operating system, which for decades has been a key platform for distributed systems work". In 2011, Thompson, along with Dennis Ritchie, was awarded the Japan Prize for Information and Communications for the pioneering work in the development of the Unix operating system. ^ Seibel, Peter (2009). Coders At Work. p. 450. ^ "Thesis Students". Elwyn Berlekamp's Home Page. University of California, Berkeley Department of Mathematics. ^ "Ken Thompson: developed UNIX at Bell Labs". Retrieved 2016-10-31. ^ Ritchie, Dennis. "The Development of the C Language". Bell Labs. Retrieved 2016-10-31. ^ J. Stanley Warford (2009). Computer Systems. Jones & Bartlett Publishers. p. 460. ISBN 978-1-4496-6043-7. ^ Ritchie, Dennis M. (2001). "Space Travel: Exploring the solar system and the PDP-7". Bell Labs. Archived from the original on 2015-12-26. Retrieved 2016-02-04. ^ Ritchie, Dennis M. "The Evolution of the Unix Time-sharing System". Retrieved 2016-10-31. ^ Dennis M. Ritchie. "The Development of the C Language". Bell Labs/Lucent Technologies. Retrieved 2016-10-31. ^ Cox, Russ. "Regular Expression Matching Can Be Simple And Fast". Retrieved 2016-10-30. ^ a b c "Dr. Dobb's: Interview with Ken Thompson". 2011-05-18. Retrieved 2014-11-10. ^ Salus, Peter H. (2005). "Chapter 7. BSD and the CSRG". The Daemon, the Gnu and the Penguin. Groklaw. ^ "Joe Condon (obituary)". Physics Today. 2013. doi:10.1063/PT.4.1752. ^ Seibel, Peter (2009). Coders At Work. p. 475. ^ Pike, Rob (April 30, 2003). "UTF-8 history". ^ Davis, Mark (28 January 2010). "Unicode nearing 50% of the web". Official Google Blog. Retrieved 5 December 2010. ^ Khamlichi, M.el. "Ken Thompson UNIX systems father". Unixmen. Retrieved 2016-10-31. ^ Seibel, Peter (2009). Coders At Work. p. 479. ^ "Dr. Ken Thompson". National Academy of Engineering. ^ Thompson, Ken (1984). "Reflections on trusting trust". Communications of the ACM. 27 (8): 761–763. doi:10.1145/358198.358210. ^ "IEEE Richard W. Hamming Medal Recipients" (PDF). IEEE. Archived from the original (PDF) on July 26, 2011. Retrieved May 29, 2011. ^ "Ken Thompson". Computer History Museum. Retrieved 2016-10-29. ^ "Bell Labs Luminaries Dennis Ritchie And Ken Thompson To Receive National Medal Of Technology". ScienceDaily. December 8, 1998. ^ "Ken Thompson Receives Kanai Award for Impact of UNIX System". Bell Labs. March 25, 1999. Archived from the original on March 26, 2013. ^ Evangelista, Benny (January 25, 2011). "Ken Thompson, Dennis Ritchie win Japan Prize". The San Francisco Chronicle. Wikimedia Commons has media related to Ken Thompson. This page was last edited on 15 April 2019, at 18:30 (UTC).